I’ve avoided blogging the last several days because I didn’t feel like I had anything to say. I think it was because I’m still coming down from the excitement of the fiber festival last weekend, kind of like a sugar crash. So today I'm forcing myself to post because I do have some things to show you. First, I finished my RegattaTee by Olga Casey and I absolutely LOVE it! It was an easy knit, even with the side seaming. 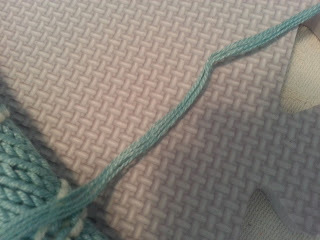 I really don’t mind seaming; it just seems to take me for-EVER to get it done. I didn’t know if I’d like the “rough” looking seams with the selvage edge exposed that the pattern calls for, but once I got it done and looked at it, I think it makes the garment more interesting than if the seams were smooth (even though my daughter asked me if I had it on inside out). It just kind of unwinds and gets tangled easily. I do have another summer shirt in my queue that I will likely use what I have left of this yarn in the white, but I doubt I’ll buy any more to use. I think when it comes to baby clothes I need to start with size 3 mos. or bigger. These two little ones aren’t even here yet and I am afraid they’ll barely be able to wear these. Lesson learned. I also have some goodies I got a while ago through Etsy that I’ve wanted to show off. First, I got this cute little project bag from Julie at Lavender Hill Knits. I wanted a bag for sock projects and this fits the bill perfectly. It is extremely well made and as you can see, is reversible. Julie has lots of other fabrics to choose from for these and I love the handle design. It closes easily by slipping the long handle through the short one. It’s a beautiful handmade, thrown pottery yarn bowl. I got it from Marietta at Blue Room Pottery. I fell in love with this bowl months and months ago and finally ordered it in May. Most of Marietta’s pottery is made to order, so it took a few weeks but wow, I am so pleased with this. It is way larger than I anticipated and looks and works much better than the small Pyrex bowl I’d been using from my kitchen cupboard. Blue Room has many, many lovely yarn bowls as well as other types of pottery. Just looking at this piece makes me happy…and who couldn’t use more happiness? Oh so pretty. I'm starting to think you might like knitting a little bit. Oh wow, that yarn bowl is exquisite! I love the colors you chose for your Regatta Tee. Thanks Lynn! Yes, the bamboo stitching weakness fades rather quickly when you put on the finished product!